Cinnamon (Cinnamomum zeylanicum) of commerce is the dried bark of the plant cinnamon. The spice is light brown in colour and has a delicately fragrant aroma and warm, sweet flavour. It is lighter in colour and milder in flavour than the other related species. In Egypt, it was sought for embalming and witchcraft; in medieval Europe for religious rites and as flavouring. References to cinnamon are plenty throughout the Old Testament in the Bible. Later it was the most profitable spice in the Dutch East India Company trade. Commercial part of this tree spice is bark and leaf. 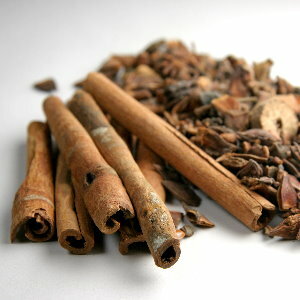 Cinnamon is native to Sri Lanka (Ceylon), and Myanmar (Burma) and also cultivated in South America and the West Indies. Cinnamon is a bushy evergreen tree (6-8 m tall) belong to the family Lauraceae, cultivated as low bushes to ease the harvesting process. 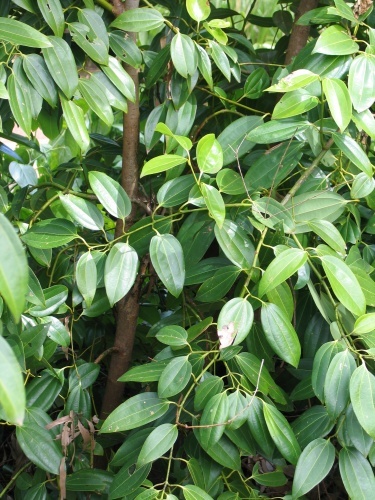 The leaves are long (10-18 cm), leathery and shining green on upper surface when mature. The flowers have a fetid, disagreeable smell. The fruit is a dark purple, one-seeded berry. It prefers shelter and moderate rainfall without extremes in temperature. Eight to ten lateral branches grow on each bush and after three years they are harvested. The Sri Lankan farmer harvests his main crop in the wet season, cutting the shoots close to the ground. In processing, the shoots are first scraped with a semicircular blade, then rubbed with a brass rid to loosen the bark, which is split with a knife and peeled. The peels are telescoped one into another forming a quill about 107 cm (42 inches) long and filled with trimming of the same quality bark to maintain the cylindrical shape. After four or five days of drying, the quills are rolled on a board to tighten the filling and then placed in subdued sunlight for further drying. Cinnamon grows in areas up to an altitude of about 1800 m. Humid tropical evergreen rain forest conditions favour the best growth of cinnamon. Well-drained, deep sandy soil, rich in humus is suitable for the crop. Avoid marshy areas and hard laterites. Since it is mostly raised as a rainfed crop, an annual rainfall of 200-250 cm is ideal. Cinnamon is usually propagated through seeds. Under West Coast conditions, cinnamon flowers in January and the fruits ripen during June-August. The fully ripened fruits are either picked up from the tree or the fallen ones are collected from the ground. The seeds are removed from the fruits, washed free of pulp, and sown without much delay as the seeds have a low viability. The seeds are sown in sand beds or polythene bags containing a mixture of sand, well rotten cattle manure and soil (3:3:1). The seeds start to germinate within 15-20 days. Frequent irrigation is required for maintaining adequate moisture. The seedlings require artificial shading till they are about 6 months old. For raising cinnamon from cuttings; semi hardwood cuttings of about 10 cm length with 2 leaves are taken and dipped in IBA 2000 ppm and planted either in polythene bags filled with sand or a mixture of sand and coir dust in the ratio 1:1 or in sand beds raised in a shaded place. The cuttings in polythene bags must also be kept in a shaded place or in a nursery. The cuttings are to be watered regularly 2-3 times a day for maintaining adequate moisture and prevent wilting. Rooting takes place in 45-60 days. The well-rooted cuttings can be transplanted to polythene bags filled with potting mixture and maintained in a shaded place and watered regular. Air layering of cinnamon is done on semi hardwood shoots. A ring of bark is removed from the semi hardwood portion of the shoot and a rooting hormone (IBA 2000 ppm or IAA 2000 ppm) is applied on the portion where the bark has been removed. Moist coir dust or coir husk is placed around the region where the hormone has been applied and is secured in position by wrapping with a polythene sheet of 20 cm length. This would also avoid moisture loss. Rooting takes place in 40-60 days. The well rooted air layers are separated from the mother plant and bagged in polythene bags filled with potting mixture and kept in a shaded place or nursery by watering the plants twice daily. The rooted cuttings and layers can be planted in the main field with the onset of rains. Select seedlings with green leaf petioles. Plant seedlings in the main field when they are 1-2 year old with the commencement of southwest monsoon. Planting is done in pits of size 60 x 60 cm at a spacing of 2 x 2 m. They are then filled with compost and topsoil before planting. Cinnamon is planted during June-July to take advantage of the monsoon for the establishment of seedlings. For transplanting, 10-12 months old seedlings or well rooted cuttings or air layers are used. In each pit 3-4 seedlings or rooted cuttings or air layers can be planted. In some cases, the seeds are directly dibbled in the pits that are filled with compost and soil. Partial shade in the initial years is advantageous for healthy, rapid growth of plants. Weeding should be done regularly in the early stages of growth. Two weedings in an year during June-July and October-November, and one digging of the soil around the bushes during August-September is recommended. Irrigate the seedlings till they get established, if there is long drought period. Prune plants when they are 2-3 years old at a height of 15 cm above ground level. Cut the side shoots growing from the base to encourage growth of more side shoots till the whole plant assumes the shape of a low bush. Apply N:P2O5:K2O @ 20:20:25 g/seedling in the first year and double this dose in the second year. Cattle manure or compost at 20 kg / plant / annum may also be applied. Increase the dose of N:P2O5:K2O gradually to 200:180:200 g / tree / year for grown up plants of 10 years and above. Apply organic manures in May-June and fertilizers in two equal split doses, in May-June and September-October. 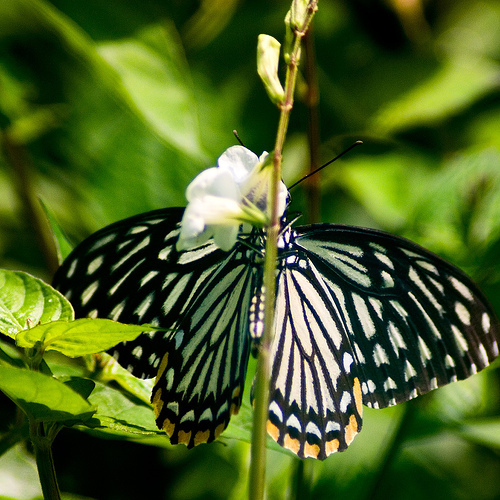 The cinnamon butterfly is the most serious pest of cinnamon especially in younger plantations and in the nursery and is generally seen during the post monsoon period. The adults are large sized butterflies and occur in two forms. One of the forms has blackish brown wings with white spots on outer margins; the other form has black wings with bluish white markings. 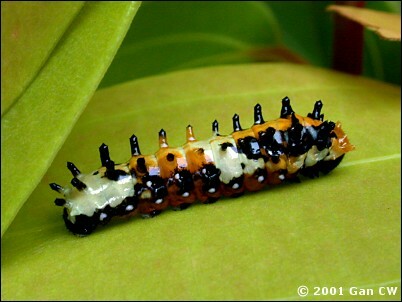 Fully-grown larvae are pale yellow with dark stripes on the sides and measure about 2.5 cm in length. The larvae feed on tender and slightly mature leaves; in severe cases of infestation, the entire plant is defoliated and only midribs of leaves with portions of veins are left behind. The pest can be controlled by spraying quinalphos 0.05% on tender and partly mature leaves. Infestation by the leaf miner is more common during the monsoon period and generally nursery seedlings are seriously affected. The adult is a minute silvery gray moth. The larvae are pale gray initially and later become pink measuring about 10 mm in length. Larvae feed on the tissues between the upper and lower epidermis of tender leaves resulting in linear mines that end in 'blister' like patches. The infested leaves become crinkled and the mined areas dry up leading to the formation of large holes on the leaves. Spraying quinalphos 0.05% during emergence of new flushes is effective in preventing the pest infestation. Many other leaf feeding caterpillars and beetles also occur sporadically on cinnamon feeding on tender flushes. Application of quinalphos 0.05% would keep them under check. On young nursery seedlings, small brown specks appear which gradually enlarge resulting in drying of the leaf. From the leaves, the infection spreads to the stem, resulting in necrosis from the apex downwards. On old seedlings and mature trees, light and dark brown concentric zonation occurs. Spraying 1% Bordeaux mixture during rainy season controls the disease. The fungus causes light brown patches on the stem, which girdle the stem and cause death of seedlings. The disease can be controlled by spraying Bordeaux mixture 1%. It is characterized by small brown spots which later turn grey with brown border. The disease can be controlled by spraying Bordeaux mixture 1%. The plants will be ready for harvest in about 3 years after planting. Harvesting is done during two seasons, in May and November. The correct time for cutting the shoots for peeling is determined by noting the sap circulation between the wood and corky layer. Peelers can judge this by making a test cut on the stem with a sharp knife. If the bark separates readily, the cutting is taken immediately. Stems measuring 2.0 to 2.5 cm in diameter and 1.5 to 2.0 m length are cut early in the morning and twigs and leaves are detached. The outer brown skin is first scrapped off and the stem is rubbed briskly to loosen the bark. Two cuts are made round the stem about 30 cm apart and two longitudinal slits are made on opposite sides of the stem. The bark is separated from the wood with curved knife. The detached pieces of bark are made into compound quills. The best and longest quills are used on the outside while inside is filled with smaller pieces. The compound quills are rolled by hand to press the outside edges together and are neatly trimmed. They are dried in shade as direct exposure to sun can result in warping. The dried quills consist of mixture of coarse and fine types and are yellowish brown in colour. The quills are graded as Fine or Continental, Mexican and Hamburg or Ordinary. The Fine consists of quills of uniform thickness, colour and quality and the joints of the quills are neat. Mexican grades are intermediate in quality. The Hamburg grade consists of thicker and darker quills. The lower grades are exported as: (a) Quillings: The broken lengths and fragments of quills of all grades are bulked and sold as quillings; (b) Featherings: This grade consists of the inner bark of twigs and twisted shoots that do not give straight quills of normal length. Chips: This includes the trimmings of the cut shoots, shavings of outer and inner bark, which cannot be separated, or which are obtained from small twigs and odd pieces of thick outer bark. Cinnamon oleoresin is prepared by extracting cinnamon bark with organic solvent. Oleoresin yield varies from 10 to 12 per cent. The oleoresin is dispersed on sugar, salt and used for flavouring processed foods. A pale yellow liquid possessing the delicate aroma of the spice is obtained by steam distillation of quills (0.2 to 0.5%). Its major component is cinnamaldehyde (55%) but other components like eugenol, eugenyl acetate, ketones, esters and terpenes also impart the characteristic odour and flavour to this oil. 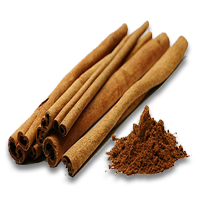 Cinnamon bark oil is used in flavouring bakery foods, sauces, pickles, confectionery, soft drinks, dental and pharmaceutical preparations and also in perfumery. Cinnamon leaf oil is produced by steam distillation of leaves yielding 0.5 to 0.7% oil. It is yellow to brownish yellow in colour and possesses a warm, spicy but rather harsh odour. The major constituent is eugenol (70 to 90 %) while the cinnamaldehyde content is less than five per cent. 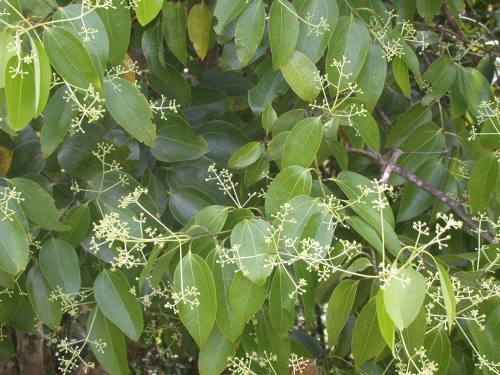 The oil is used in perfumery and flavouring, and also as a source of eugenol. The root bark contains 1.0 to 2.8% oil containing camphor as the main constituent. Cinnamaldehyde as well as traces of eugenol are found in the oil, having less commercial relevance.